Formulated by Dr. T.J. Lafeber and an avian nutritionist, the Classic Nutri-Berry revolutionized the pet bird food market. Nutri-Berries contain hulled canary millet, cracked corn, and safflower blended with peanut and other natural ingredients rolled to form a “berry” shape. Nuggets are coated with vitamins, minerals, and amino acids. Nutri-Berries may be fed for maintenance or dietary conversion. The color, rich texture, and shape of the Nutri-Berry makes it an excellent foraging treat. Natural ingredients with added vitamins and minerals. Visit the Nutritional Equivalency Report and Nutritional Strategies for the Companion Parrot for additional information. All seeds and grains are hand-inspected for cleanliness and freshness. We make small batches to insure the best quality possible. 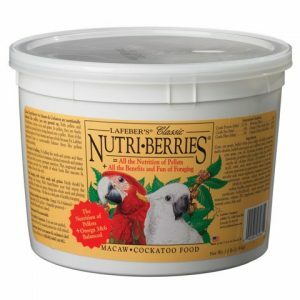 Nutri-Berries are packed in resealable bags or freshness sealed tubs to maintain freshness and “chewiness”.